Lawn maintenance in Northern Virginia, as provided by Complete Lawn Services, can meet all your lawn care and landscaping needs. Among all the Northern Virginia lawn maintenance companies, we are the most skilled at full-service landscape design. Lawn maintenance in Northern Virginia takes a special level of competence and Complete Lawn Services has been meeting its customers’ lawn care and landscaping needs since 1972. Call all the other Northern Virginia lawn maintenance firms you desire, you will receive the best full-service landscape design from us! When other organizations providing lawn maintenance in Northern Virginia let you down, contact Complete Lawn Services. For full-service landscape design as well as lawn care and landscaping, few Northern Virginia lawn maintenance teams will provide better service than we can. Do not be deceived by nor take lightly the importance of proper mowing. 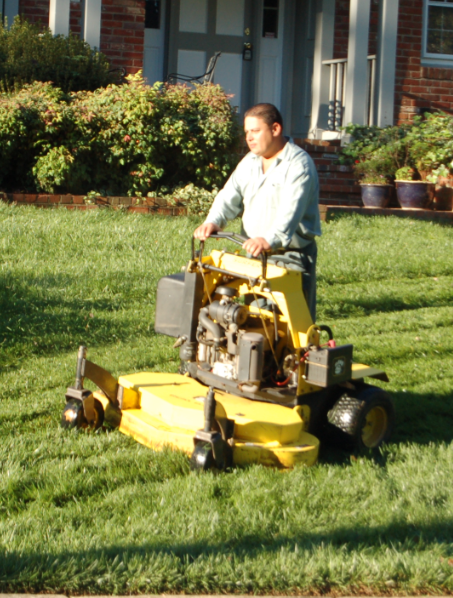 If you are picky about your property then you will love our mowing service. We offer our Mowing & Edging services in Arlington County, Fairfax County and Alexandria. Our regular service provides you a well-manicured lawn throughout the growing season, without the hassle of doing the work yourself! We mow weekly and edge every other week and ensure your grass is mowed between 2.5″ and 3.5″ depending on the time of year. We bag in the early spring and late fall and recycle the clippings most of the year and we sharpen and balance our blades regularly. We normally begin mowing services the last week of March as your lawn is emerging from its winter dormancy. We continue to mow through the middle of November although dates may vary due to weather. Posted June 30, 2015 & filed under Northern Virginia lawn service.